The Cricket starts at 8am on the 29th April; the entrance is $3.00 for adults and $1.00 for pensioners and children. There will be entertainment throughout the day with activities for kids as well. There is a Back to School themed dinner on Saturday night with a variety of food available to suit everyone’s taste. The Entrance is only $5.00 per person and DJ Frank will have everyone rocking the night away. So; find those old school trunks, dig out your old uniforms and parade them! There are prizes for the best dressed teams and individuals. Just mind you follow the School Rules because the Headmaster and Headmistress will be on the prowl to dish out their punishment! On Sunday, there is a pub night which promises to be brilliant, and you don’t need to worry about Monday, because it is a holiday! There is free camping available with showers, toilets and ZESA. There is also alternative accommodation around Kwekwe if you don’t fancy camping. 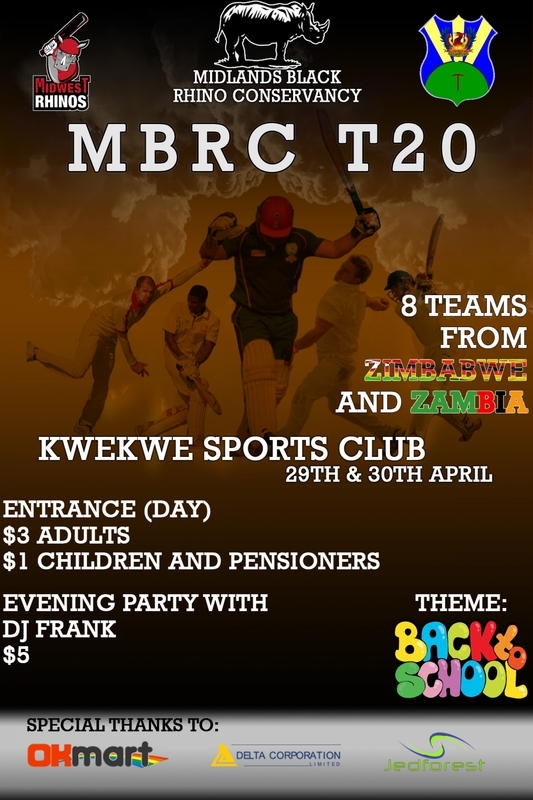 This tournament is in aid of the Midlands Black Rhino Conservancy, and as you know things are very tough in Zimbabwe. We are appealing to anyone that can help us, whether in cash or kind (umpires shirts, goodie bags, prizes, raffles, services etc.) we will be eternally grateful. If you are able to sponsor, whether in cash or kind please let me know. All our sponsors will be able to advertise, put up their banners, flags etc. the whole weekend for free, as well as be announced over the PA system and acknowledged on our website and Facebook pages.